Very short, a great intro to growth hacker marketing. Tags: Growth hacking, marketing, PR, advertising, entrepreneurship, startups. You’ve heard of growth hacking and growth hacker marketing but you’re not sure what it’s all about. You don’t have a lot of time to learn about growth hacking, but you need to get educated on it–fast. You want to read anything and everything to do with growth hacking. You’re looking for a better way to boost your marketing, at low cost, and you’re out of ideas. You want more marketing results without huge costs, or dramatic marketing results at any cost. What Growth Hacker Marketing is not, is a lengthy history of growth hacking, scores of case studies, and detailed instructions on how to engage in growth hacking and clever marketing. 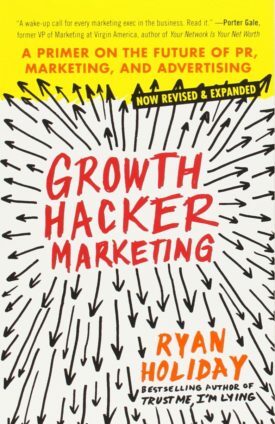 It’s an introduction to growth hacking, and it’s quite short, only 144 pages. You can read it in a sitting. But if it’s short on pages, it’s long on value in the few words Holiday uses to get his points across. And the book itself and the marketing campaign that accompanied it is an excellent case study in growth hacker marketing. You can get some insight into Holiday’s personal marketing tactics here, here, here, and here. If you’re planning on writing a book and want tips on how to market it, Holiday is your muse, and this book will help you get started. But Holiday, and his book, is also your muse regardless of what you’re marketing. As he points out in the book, growth hacking is not a list of tactics, it’s a mindset. Once you adopt the mindset, you’ll be able to create your own tactics. This book won’t be the end of your journey, but it’s a good beginning.